Caution: This is not an easy recipe, unlike most of the other recipes on this site. Please read each step carefully before proceeeding. No, there is no mistake in the recipe - it works, as long as you follow each step! In my previous post about Japanese food, I talked about what makes up a typical Japanese meal, which applies to breakfast, lunch and dinner. There's a fourth meal that is very much a part of Japanese food life - oyatsu. Oyatsu is snack time, and it's usually eaten at 3 in the afternoon. Oyatsu consists of a drink, which is usually tea for adults and milk or soft drink for kids, and a sweet or savory snack. A lot of the Japanese snack industry is geared towards oyatsu items. It's lighter than an English afternoon tea - it's more like elevenses (the snack that was traditionally consumed around 11 in the morning in England). It helps to keep hungry kids going until dinner time, and provides a good excuse for the adults to take a break. Kasutera is a kind of sweet that is hardly ever baked at home in Japan. It's available in all price ranges, from mass-produced plastic wrapped kinds that you can buy in any supermarket to expensive "gourmet" labels. Perhaps because the Portuguese influence was the strongest there, the southernmost main island of Kyushuu has some of the best kasutera makers. I used to work for a company run by a family from Nagasaki. Although my boss was very difficult to deal with in many respects, he almost redeemed himself in my eyes by always bringing a block of delicious kasutera with him whenever he flew back from Japan. A good kasutera is moist, with a very fine texture, and is very light. It should have a dark brown and sugary top and bottom - the sides are usually cut off, exposing the yellow crumb. It is sweet yet not cloyingly sweet. It does not have a speck of oil in it - no butter, no margerine, no shortening. Yet it is very rich. The best flavoring is honey, though other sugary syrups are often used too. There are variations, like matcha (green tea) or chocolate flavored, but I prefer the traditional honey flavor. A slice of kasutera is the perfect accompaniment to a cup of hot green tea, unsweetened of course. If I lived in Japan, frankly I don't think I would make my own kasutera because of all the delicious brands out there. It's also not that easy to make, since it uses the classical cake making method of whisking together whole eggs and sugar in a bowl over hot water until it's thick. But it's hard to get good kasutera here, so on occasion I haul out my electric whisk and get going. The results are usually worth all the effort. The only bad thing is that the kasutera disappears so fast. Please note that the measurements for the original Japanese recipe that I've adapted for this one is in metric, and unlike many other of my recipes it's best to be pretty precise in your measurements for this. So I have given amounts in grams/ounces rather than cups. Before you proceed: Unlike most of the recipes here on Just Hungry, this one is not easy to execute. If you are a cake baking novice, you may want to tackle something simpler before trying this. Please read through the instructions completely. Preheat the oven to 170°C / 340°F, or 150°C / 300°F if you're using a convection oven. Cut the parchment paper so that it's large enough to fit the bottom and sides of the cake pan with a little excess. Fold it in until it completely covers the bottom and sides, leaving a it hanging over. (To make it stick to the pan, smear a little butter or shortening on the pan first.) Sprinkle a little sugar over the bottom, on top of the paper. Fill the pot with water and bring to a boil, then turn off the heat. Mix together the milk and 4 tablespoons of honey - you may need to heat up the mixture for a few seconds in the microwave. When you are done the batter will be thick enough to form soft peaks when you draw up your whisk. If you write your initial on the surface with the whisk, it should stay there long enough for you to read it before it disappears. Whisk in the milk and honey mixture. Add the flour with your hand whisk a tablespoon at a time, beating until there are no pockets of flour. Pour the batter into the pan up to the top. (see notes about what to do with any leftover batter.) Put in the oven and bake for about 50 minutes or until a skewer stuck in the middle comes out clean. In the meantime, mix together the 1 tablespoon of honey and a little hot water, to make a glaze. As soon as the cake is out of the oven, brush the top with the honey-water mixture. When it's cool enough to handle but still warm, lift it out of the pan, paper and all, and put into a plastic bag. Seal the bag and put into the refrigerator, for at least several hours. This step is critical to ensure the kasutera has a moist texture. If you let it cool to room temperature before putting it in the plastic bag, it will end up a bit dry. To serve, use a very sharp knife to make clean cuts. Cut off the sides (cook's treat) and make small, neat slices - one or two per person. Serve with hot or cold unsweetened tea. This batter is the right amount for a rectangular cake pan about 30 cm long x 10 cm wide, but most people probably have a 25cm / 8 inch square cake pan, and the kasutera comes out fine in that. You may have some excess batter, which can be baked in lined cupcake/muffin tins alongside the main cake. Take the cupcakes out after 20-25 minutes, then continue cooking the main cake. I can get a whole square cake plus 6-12 (depending on the size) cupcakes out of this. Green tea is great with this, or try genmai-cha (green tea with toasted rice grains in it). In the summer, a cool glass of mugicha (toasted barley tea) is perfect. Please note that I'm no longer responding to "This recipe doesn't work!" comments. The recipe has been up here for years and it has worked for most people. Again, please be sure to follow all the steps carefully. Or, try another, easier recipe on this site. Submitted by maki on 2006-08-22 16:49. Bunmeido's castella has been a favorite of mine too, since living in Nagasaki for a few years in childhood. What I find particular about it is that it tastes like wagashi even though its ingredients are those of a sponge cake. It definitely goes best with green tea. i tried this recipe today and i liked the taste very much. it's very sweet and has a rich honey flavor (i like that). but i'm not really sure, if my cake is like it should be. i think i did everything ok until i have to put my batter into the oven. the batter looked very nice compared to the batter of chiffon cake or a bisquit batter (since they both have very similar ingredients; especially the bisquit batter). the first, say 15min, the batter slowly rose - but then it suddenly began to slowly flatten down, which i was very suspicious with, since my cakes never flatten unless i did sth wrong. the final cake (after refridgeration) is still very much like a sponge texture-wise. but in comparison to chiffon cake for example is rather elastic and much more hard and a little dryer. is kasutera meant to be like this or did i do sth wrong? i never had kasutera cake before, that's why i don't know. Serena, in my experience the cake does flatten a bit, though usually after it comes out of the oven. It isn't featherylight like a chiffon cake - I think this is on purpose, since the Japanese palate has traditionally favored a sort of glutinous texture to food (rice, bread, noodles, etc). The dryness can be prevented by putting the cake in a closed plastic bag as soon as it comes out of the oven. Some people spray the inside of the bag very lightly with water too. Also, most commercial kasutera has the ends chopped off (the ends are the driest/hardest parts). thanks for your tipps, maki! i will try again - this time put the kasutera earlier into the plastic bag. thanks for this really delicious recipe! I found the original castella ad! Thanks for the recipe: after watching "Yakitate! Japan", I was looking for a recipe and I will try yours. By the way, "Yakitate! Japan" is a great anime. If you can stand japanese humor(...I mean "weird humor"... please, do not take offense, maki-san^^), give it a peek. Thank you so much for posting the recipe. I first heard the Bunmeido jingle 30 years ago, as a kid growing up in Japan...and it never made much sense, but I sure loved the cake! I will probably have to adjust your recipe a bit since I live by the Rocky mountains, but I look forward to tasting one of my childhood's favorite sweets. Ned, thank you so much for the link to the video! It's a bit before my time but if I remember correctly they didn't change much over the years. It really makes no sense either but I guess that's part of the appeal of it, in some odd way. I've read Yakitate! JaPan - it's really outrageous but funny. I think I've read up to book 15 or so..never seen the anime though. Sue I hope you give it a try! Thank you for the great recipe. Since I have never bothered to buy an electric mixer I made the recipe by hand and even though my arms and wrists are crazy sore, it was well worth the effort! The flavor was just as good as store bought kasutera and the texture was much, much nicer. Next time though, I think I will have to get my husband to tagteam with me on beating the eggs! My only comments on the recipe would be to fill the cake pan only 3/4 of the way to the top and to cut the parchment paper a bit higher than the sides of the pan to insure that the batter doesn't overflow when it rises. The cake that I made rose right out of the pan, although as you noted, it did flatten out as it cooled. Thank you also for posting a photo of the finished cake. There were several recipes for kasutera online but your photos, along with your detailed instructions, convinced me that this was the best one. Shirley, putting a high 'collar' on the pan is a great idea. I'll try it next time I make castella. Thanks! And I'm glad you liked the recipe! Don't use 340C or 300C... should be "F". Thanks for the recipe, Maki! I just made some kasutera, but with a different recipe online. This one's has a texture that's light and airy while being slightly elastic. I make mine with raw wildflower honey and turbinado sugar to give it a less bland flavor. Kasutera origins are in Spain NOT Portugal. (Castella name comes from Castilla Kingdom indeed, which was located in Spain. As with tempura, it was introduced by Spanish and Portuguese missionaries). I just noticed this comment was here now. Well it seems that the origins of kasutera are not certain - it's either based on a Spanish cake, a Portuguese cake, or a combination of both. There's even a book about it (in Japanese of course)...by a leading kasutera maker in Nagasaki, Fukusaya. Either way I guess it is safe to say whatever inspired it was brought in by missionaries, but has of course evolved into something uniquely Japanese. So let's leave it at that. When I bake it for 50 min at 340F how come it's not done baking? It comes out all water like. The top is a nice golden brown, but the inside still hasn't baked yet, why? I just discovered your site -- great! Thank you for all the great recipes and context! Recently I am really into kasutera, Paku gave me some kasutera the other day from a 'shinese' (old and famous shop) in Kyoto. It was unlike any I had ever had before! It was made with rice flour. I see in your recipe that kasutera calls for 8 eggs! Wow! Hello, I'd heard of castella before but wasn't terribly interested in it until I read your description. I now love it and I agree it is a good tea cake. I used a different recipe using almond flour (ground up almonds) as I can't eat anything made with wheat or gluten or grains and it came out beautifully - it looked pretty similar to your castella picture. It tastes good and is light and spongy. 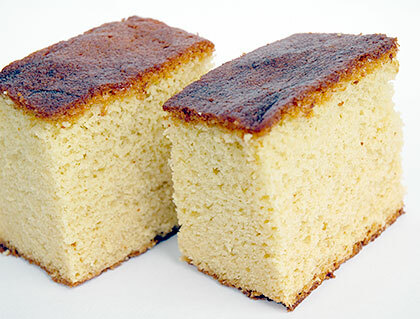 I'm thinking of having my own food site with my own recipes, etc., and I think I'm going to have my version of castella. I really enjoy your site because it offers realistic insights into Japanese cuisine and culture, etc., etc., and I love the name "Just Hungry." I've seen your bento website, too, though all I can do is look at the pictures - none of the hyperlinks work for me. But all in all, your site is soooo cool! Keep on going and thanks a million! I'm glad the castella works though! The almond powder version sounds delicious. As I write this, my kasutera is in the refrigerator. It took a while to make, but was definitely worth it. We (my mom and I, it was a two-person job, plus I'm only 14) had some batter left over and made 3 huge cupcakes - I didn't even put them into the refrigerator, I just glazed them and ate one. My mouth exploded into a medley of flavor and deliciousness. It was only flavored with honey, but it tasted so good! Warm, light, sweet-but-not-too-sweet, and gooey - the cupcakes turned out perfect! Thank you so much for providing this recipe. Kasutera has now become my favorite cake. My mom liked it too as she doesn't really like overly sweet things. I enjoyed it with a glass of iced peach tea (I don't really like hot tea, and we didn't have green tea). My whole family loves this cake - thank you again. I can't wait until the actual big square (8 by 8) kasutera comes out! I'll post some links to some pictures when the cake is out of the fridge and ready to eat (which is when I will actually take pictures). If the cupcakes taste anything like the cake, which it should since it was made from the same batter, this cake will be (in a few hours) marvelous. I love kasutera. Thanks again (again) for the recipe! Zach that's great! You're 14 and on your way to becoming a master baker! :) I'm glad the recipe worked well for you. Please do post links to the photos of the kasutera if you can - I'd love to see them! And you mention it here. It was great! good tip on putting it in the referagortor, yes indeed that it took a long time, but the way it tasted was worth it. i had sprinkled some suger on top of it when it came out of the oven then used a torched to burn the sugar then coated it with the honey XD tasted really good. A japanese friend served me this cake for tea recently, and I was surprised with this delicious cake (I like my cakes not to be overly sweet, a rare thing nowadays ^^). I was glad to have found your recipe, but I'm a bit confused over the pan I should use : is a 8-inch loaf pan suitable for this cake ? I usually use an 8 to 9 inch square pan or brownie pan (like this one). Hope that helps! All right then, I think I'll try halving the measurements for this recipe and line up somme cupcakes to see how it works. It should work fine in a round cake tin. You may have to adjust the cooking time (it may be shorter since a round shape cooks more evenly) - if a skewer stuck in the middle comes out clean it's done. Try adding a tablespoon or two of matcha (powdered green tea) to the batter. Also, (sorry) is it possible to adapt green tea into this recipe and make it a green tea kasutera? Hi there, Bunmeido is my dad's favorite, he insisted that this brand is the best and not replaceable. It is a bit sweet for me but I want to try your recipe and maybe make him one when I go back to Hong Kong one day. I also found a recipe from about.com and now yours when I googled. I will give some courage and give a try. It's so nice that your recipe is in metric but not in cups. I just made this over the weekend. The batter was actually enough to fill 2 brownie tins, so it did occur to me that one large slice tray might fit it all (with less crust!) - but then I don't know where I would find a ziplock bag that big. It definitely tastes better the next day. It's damper, and you can see the texture sink a bit near the bottom. Hello Maki! I just wanted to ask why you ward against using cake flour in the recipe? Shouldn't its use make an even lighter cake? ...but of course you have an explanation! Castella has a slightly springy and moist, rather than crumbly/dry, texture - this texture (which is considered to be very desirable in Japan, for a lot of things) is mochi mochi . I think that's why bread flour is usually used, since the higher gluten content helps to make it springy-moist. I tried baking this, but I have the same problem as a person who already commented. My castella, while looking fine on the outside, is raw, hard, grey, and gooey on the inside. I don't know what I did wrong - usually my cakes turn out fine. I tried the recipe two times, the second time with more flour, but it still turned out rather raw. Should I switch cake pans? Only the outmost layer is browned. Everything below that is still indistinguishable from my batter mix, except for the noticeable lack of color and the hardening. I also returned it to the oven several times in the hopes that it would somehow solve itself, but the problem still persisted. The name of the portuguese cake "pao de Lo" was introduced by portugueses in Japon and not by Spain. Nagasaky was an portuguese city,the evidence is almost the habitants are catholics. The portuguese were the first westerns to arrive to Japon, in 1543. When americans send a nuclear bomb on Nagasaky, they forgoten that the habitants of Nagasaky were christians too. I'm portuguese and i am accustumate du eat "pao de Lo" and in Portugal there are different kinds of pao de lo, it's nearly the same it depends of the regions. Hi there. You mentioned that it is possible to substitute different flavours in, such as green tea. I was wondering what the tea substitutes, or do we simply add it on top? I suspect that the point of exchange is the honey? If so, is it only the milk+honey, or the glaze as well? Does the milk need to be taken out as well? P.S. I have a batch baking the in the oven right now. Third time I've made it, hope it turns out alright; there was a double yolk egg in amongst the other 7 eggs I used, first time I've seen one! Was wondering if i could use this recipe for Japanese Strawberry Shortcake? Not really. The most appropriate sponge cake to use for a Japanese shortcake would be what is called a genoise. You can google it for several recipes, or you can also find it in any book that has French cake recipes. Why is it necessary to hold the bowl over the pan of hot water to whisk the eggs? If I use a stand mixer, could I whisk the eggs without heat? Whisking the eggs and sugar over a bain marie, or hot water bath, is a fundamental method in classic cake making. It produces a smooth, close textured sponge. So if you skip that step you will get a sponge with a more open texture, which is not really want you want in a kasutera. If you use KitchenAid stand mixers, you can actually buy a bowl attachment thing where you can put in hot water to do this method. - this thing (the 'Water Jacket'). I just wanted to add the water jacket is for the K5, not the standard artisan mixer. Would have been nice, but I just bought the Artisan so I'll have to make castella by handmixer still. I have also found that two 22cm square cake tins x 4 cm deep are perfect for the batter! Can't wait till I try this recipe. My mum every so often recalls her childhood back in Japan (she's now 75 y.o and has lived in Sydney Australia since the late 60's) and mentions how she can still remember how good kasutera tasted. I only asked her the other day whether she would like me to try and make it for her and she said you couldn't make kasutera at home. So here goes - wish me luck!! Will keep you posted on the outcome. btw, would you know how to make yokan? i tasted one at a nearby japanese restaurant and i wanted to try my hand at it. While in Japan last month I unfortunately did not get to eat any kasutera, not even the baby kasutera they have at the festivals. So, I made kasutera today using your recipe and it turned out excellent. I changed the recipe just a teensy bit by omitting two of the eight eggs - but that's only because mine were jumbo sized! Also, I used buckwheat honey instead of regular honey, for its old-fashioned molasses-like flavor. There was enough batter for a 1/4th size steam pan (11"x7") and a 6" round cake pan. The round cake I ended up flavoring with matcha powder, since I had it around. I should've sifted it though, it ended up clumping a bit in the batter. Anyhow, the kasutera turned out delicious! Soft, airy but still with that bit of elastic that I just love. I ended up eating the 6" cake by myself while watching TV, after letting it "sweat" for two or so hours. The larger loaf I trimmed and it looks exactly like the cakes you'd find in a Japanese department store. My mom likes it so much she wants me to bake a double batch to take to her church. Thank you so very much for posting this recipe. I will be sure to share it with others. i would like to try it again because i find it really fun and it tastes heavenly ^^ thank you for making this site i love it! oh er.. i'm kid of really mad about straberry shortcakes everytime i watch japanese cartoons and really want to try making it once but i cant find the recipe. do you have one? I tried this recipe yesterday, and made a couple of changes to it, so it's hard to tell precisely where I failed. I'm hoping you can tell me. I swapped out the granulated sugar for brown sugar (according to these guidelines: http://www.ochef.com/91.htm), and the honey for maple syrup. The egg mixture never became the consistency you described (soft peaks never formed), even thought I whisked it for about twenty minutes. So, anyway, I poured the batter into the pans, and baked them for 50 minutes. I puled them out, glazed them, and put them into sealed plastic bags. When I went to check on them later, I noticed that only about the top inch was edible and cake-like. The bottom half-inch or so was an opaque beige jello-like substance. This is not the easiest of recipes - as a matter of fact, it may be the most difficult one on this site. (One reason why castella is regarded as a cake you buy rather than one you make yourself in Japan!) So it is rather important to follow the directions precisely, unless you are a baking expert. There is a different between the texture of granulated vs. brown sugar - brown sugar has a lot more moisture in it for one thing, and for a delicate cake like castella substitutions may not work. But again, I haven't tried substituting myself so I can't say for sure at all. You simply have to get that 'soft peak' texture. So, if you really want to make castella, I'd recommend following the recipe as closely as possible first before attempting variations. There are other, much more forgiving cake recipes on this site though! Try seperating the egg yolk and white and whisking only the white - nearly all the advise regarding whisking egg whites seems to recommend that you don't let a speck of fat get into the white as it prevents it from rising. I usually whisk egg whites by hand and it is ok.
How interesting! I have a family recipe, handed down from my grandmother, for a "custela" that seems to be the same cake. I didn't know about the cultural context in Japan before. My grandmother's recipe is based on a cake that her mother, who emigrated from Japan to the US around, I think, 1905, used to make (and which was apparently like one that her mother used to make). The recipe is very different from yours, however––far fewer eggs, no honey, no beating over hot water; but like your kasutera it does not have butter or oil (it gets all its fat content from cream). I imagine the differences are probably due to adapting to the conditions in America over the years––now I am tempted to try baking both recipes and see how they compare! after you let the cake cool down in the refrigerator, do you still have to store it in there? or should you take it out to be at room temperature? You should store it in the refrigerator, since it can dry out, though I've had it out for a whole day at room temp and it was fine. any idea how to fix this problem ? ? ? If you examine commercial castella blocks, you may notice that they are all cut from the middle of the cake. No edges! If you do that to your cake (cut out a neat block, without the edges) your castella too will look perfect. Don't forget to cool it in the bag though as per the instructions, to retain moisture. Light, moist, well worth the time it took to make those eggs creamy! I followed the recipe to the letter and the kasutera turned out wonderfully. I'll be making it again for sure, and next time, I might be adventurous and try it with matcha. I wanted to try and make a coffee version of this. How would I incorporate the coffee flavour to the cake? Hi thanks for the kasutera recipe. This is by far the best kasutera i've ever baked and taste just like store bought ones! I've featured this recipe in my blog. Do check it out! may i know why must we sprinkle sugar on top of the paper?? does it make the paper stick to the cake?? please tell me i'm really qurious about it. The sugar creates a sort of caramelized crust, which adds flavor. Thanks for a great recipe. I've tried several kasutera recipes and different pans. I've noticed that many of the kasutera bakers use wooden pans. One of the most successful versions I've made was with a tray constructed from a manila file folder lined with foil, and Kleenex tissue boxes (large taller ones). A trick from a Chinese friend's cookbook is to turn the cake out onto plastic wrap on a smooth counter, wrap it up, then wrap in a steamy towel. I guess that is the same concept as your plastic bag. Turning it out, though, gives a nice flat top like a commercially purchased cake. Also, a video here (in Chinese)shows a kasutera made in a wooden frame lined with lots of paper, and the cake has naked sides straight out of the pan. This has been similar to cakes baked in paper boxes. Just thought I'd add a few notes. I followed the directions to a tee and everything seemed to be going well. When I took it out of the oven the top was the darkened brown and the toothpick came out clean. It was spongy to the touch and I quickly put it into the refrigerator. Unfortunately, when I cut into it there was a dense, super moist layer on the bottom with a very thin sponge like layer! This does not at all look like kasutera! Eaaak, what could have gone wrong? I am an experienced baker and usually do very well, and I've never had any problems with your recipes before. I would try again, but I'm afraid of wasting another 8 eggs. hi, thanks for the recipe. this honey cake is really yummy! I've always loved the castella sponge cake but I also like to bake. I read your recipe and also watched the video. It's amazing the amount of time these guys spend whisking the batter!!! I wish to have their energy and enthusiasm. Thank God, we have electric whisk. Your recommendations are simple and precise! However, I have a concern. According to the video, they whisk the whites and yolks separately, but there is no such separation in the recipe. Do you think the cake will be "spongier" if I whisk the whites first until fluffy and then incorporate the yolks? What are your thoughts and what do you recommend? Thanks, Lola. 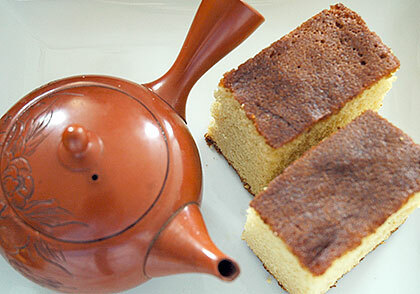 I seen countless recipes for castella (kasutera) cake, but so far, this is the authentic looking one. Is it possible to do this cake using rice flour? I was using an electric beater on medium speed and it took an hour!!! for the eggs to fluff up. Cake is in the oven as we speak, accompanied by a dozen cupcakes. The batter tasted, and looked, amazing. I can't wait! I'm thinking it might have taken so long because I had to sub 2oz of brown sugar, since I didn't have quite enough white sugar. I read above about the cake flattening a bit, which I understand, but whenever I make it the sides slant inwards.. like they're too heavy for the rest of the cake. Is there something I'm doing wrong? - did you put the cake in the plastic bag? That is a pretty critical step, or the cake will sink in the middle. - did you whip the egg enough? Otherwise it can't hold up the flour. PS: I find the use of milk somehow strange... I thought most asians were lactose intolerant. Any ideas? No, not every Asian is lactose intolerant. Milk and dairy products are enjoyed by the vast majority of Japanese people. This is the second time I've made castella according to your recipe, and this time I tried it in my grandmother's heavy copper bowl - the solid copper kind. She claimed that it made egg whites beat up faster - I discovered that this is indeed true -the ions in the copper react. The bowl definitely helped the castella come together faster. If you have one, try using it next time! This might be a silly question but can someone please tell me if we're supposed to cover the cake while baking? so,they were sticky, sugar bottom peeled off along with the baking paper, and slicing was a pain! they did rise but slicing them made them flat again! and heavy, very dense just like a caramel slice opposite effect of a sponge. but it tasted good. it did rise while beating, then added flour. then overmixed!! my fault, but co workers ate it all up. i called my monstrosity custard slices. kiwis love custard... by the way im from new zealand. and now i ran out of eggs. But when mine came out it was a lot like a sponge cake. A soft, sticky and sweet sponge cake. The bottom most was also fluffy and pale yellow, not a brown colour. The entire cake was spongy rather than dense, I think Castella's are denser? I'm not sure, since I've never eaten one before. I changed the amount of ingredients a bit, is that why it didn't turn out as expected? I put in about 50g less white sugar and 1tbs less honey, since my cousin doesn't like cakes which are too sweet, but it still came out really sweet... even for me. Oh, I didn't use an electric beater. I hand whisked it for slightly less than an hour to get somewhat the consistency mentioned. I couldn't do it anymore as the bowl was almost full to the brim... which never happened before! My cake was not dry at all, and was still quite moist after following your instructions to bag it into the fridge. I'm eating it for breakfast everyday before school, even if it didn't come out as planned, it's a good perk-me-up treat in the morning. Sooo, I made this recipe entirely by hand, and I mean by HAND(as in the muscle of my arm) because I have never owned an electric mixer, hand, stand, or otherwise. It took me about 40-50 minutes to whip up the eggs and sugar. I was justifiably proud of myself and realized after pouring the batter into the pan that I forgot to sprinkle some sugar on the bottom, which bums me out. I like that caramel crust on the bottom. Oh well. I just popped it in the oven and hopefully it won't matter that much. Will it work if I just want to make half a recipe? While most of the recipes I post here can be halved or doubled or whatever easily, in this case I would advise against it, since it is rather tricky. Try out the original quantities first before fiddling with it. Just wondering, would it make any significant difference if I reduce the sugar by a couple of spoonfuls? I find it a bit too sweet. Thanks. Congratulations on making it work! :) Reducing the sugar a little bit should be ok, though keep in mind that this cake is meant to be eaten with unsweetened green tea, which accounts for the sweetness to counteract the slight bitterness of the tea. My japanese friend showed me a recipe for Nagasaki kasutera where you have to make your own cake tin out of newspaper. It's quite fun and easy to do. In that recipe we also used kyorikio, which I think is "strong" flour used for making cakes. Although that kasutera came out perfectly, this recipe looks easier. Thank you for posting this recipe there, I have tried your other recipes and they have worked, so I have no doubt this one will too. I understand there's no oil or butter in this recipe and sugar is abolutely essential, but do you think it is possible to reduce the amount of sugar used such that it would not affect the texture of the cake too much? I do not mind adding a bit of oil to maintain the moistness of the cake, just that 300g of sugar vs 200g flour sounds much too sweet for my liking. I really love kasutera cake texture except the sweetness level of commercial ones is always way too high for me and I am really hoping to be able to make one at home with lower sugar content. Thank you so much for your advice. Hi I just made a kasutera with your recipe....but I have a question to ask because my cake sank in the middle when I took it out to cool...does that mean I didn't beat the eggs enough? When i mean sank, i mean as in quite a big dip. I have a question about the recipe. "Add the flour with your hand whisk a tablespoon at a time, beating until there are no pockets of flour." Should you still beat the batter at setting 1 or higher? What does it mean when you say, "add the flour with your hand?" It's hand whisk, not just hand. I recommend adding the flour slowly, with a whisk, not an electric beater. First of all, thank you for sharing this fine recipe! In many sources, it is mentioned that Kasutera is often made with starch syrup or starch powder (for example Maizena). If we wanted to try out this recipe by doing so, how much starch syrup or Maizena should be added? Would it mean that we would have to decrease the quantity of flour or any other ingerdient at the same time? You did it again! Your recipes are fail-proof. I used 30cm X 23cm roasting dish and 9.25"x5.25"x2.75" loaf pan. I also multiply the recipe by 1.5 ended up using 12 large eggs. I cut down sugar and used about 350g. 300g flour, 150cc milk, and 6T of tupelo honey were used. Baked about 35 min @ 340F. Edges looked dark brown but it wasn't dry after I sprinkled honey+water glaze. I'm thinking it's because of rich golden color of organic egg yolk. I think I will shoot for 30 min next time. They were delicious and sweet- the best kasutera recipe I've used so far. They were very spongy and got its elasticity. They didn't sink as much as the other recipes Ive used in the past. Maybe because I used my mixer at level 1? Anyhow, Thank you so much Maki. You're the best. I wish you and your family great health and blessings. Thank you so much. hello Just Hungry. I am glad that i stumbled into your blog. It was so wonderful. I tried this cake today and it was, by far the best cake that i have ever baked.Though it lacked the velvetty texture of the original castella, it was so soft and moist that i couldn't believe myself.I used AP flour instead of bread flour(it is not available in India) Thank you so much for this post. This recipe works really well, too. I could never really get a successful castella with the recipe here (but not because of the recipe - it was because I don't own an electric mixer and instead own a stand electric mixer). The recipe above doesn't require whisking the eggs above a bowl of hot water. I just tried this recipe, and my castella came out fantastic. After 5 times, I finally got it similar to a brand of castella that I like (I don't remember the name but it's one of the most expensive that I've purchased at $20 a loaf). Anyways, I used 7 egg yolks and 1 egg white. My husband and I both think the end result was a tad bit eggy so we cut back on one yolk and it definitely did the trick! I also added 1/2 teaspoon of vanilla to give it a hint of complexity. For whatever reason, in our first 4 attempts we could not get the egg mixture to the texture required (a couple of times we gave up a little too early after mixing for more than 15 minutes). Not sure if it has anything to do with where we live or humidity or whatever, but we vowed not to give up until the right texture was achieved on the 5th attempt. Anyways, here is what we did in hopes that it will help someone who's had the same bad luck (used a hand and stand mixer). Separate the egg yolks and egg whites (these should not be cold to start with). Whip the egg whites in a bowl on medium speed, over a hot water bath, until very soft peaks form (this took me ~10 minutes). Transfer the egg whites, egg yolks and sugar into the stand mixer bowl, and whip on medium speed until the texture is as indicated in the recipe above (I did not need to have a water bath for the stand mixer bowl, however I did warm it before by placing it into the hot water bath; I did not rewarm it). This second phase of mixing took another ~20 minutes. It took a total of 30 minutes of mixing/whipping to get the right consistency. The rest is a piece of cake as indicated in the recipe above, so I won't reiterate it here. I tried granulated sugar and all-purpose flour a couple of times, but used raw cane sugar and bread flour the fifth time, and I think it makes a ***HUGE*** difference. Raw cane sugar gives a nice crunch on the bottom layer of the cake whereas granulated sugar does not. The bread flour seems to make it more refined/soft in texture. Anyways don't give up and hope that helps! And of course, thank you for the recipe! I posted an alternative recipe earlier (2 posts above), but I never offered a translation. Here's a translation with a few of my own notes from experience with this recipe (I made castella this way about 5 or 6 times now). Step 1: Preheat your oven to 355 F/180 C. In a large bowl, mix eggs lightly. Then add all the sugar at once and mix at high speed on a stand mixer for 10 minutes (level 7 on a KitchenAid stand mixer). The eggs should double or triple in volume. Step 2: In a separate bowl, microwave the milk. Then add the honey and mix until the honey is fully dissolved. Step 3: Add the honey-milk mixture in one or two additions and mix at low speed for about 1-2 minutes. Then at the same speed, add the bread flour in 2-3 additions. Stop the mixer and test if your batter is thick enough by trying to write your initials with the batter. If the batter comes down in ribbons, the initials stay there for about 5 seconds, and the batter seems very thick, then your batter is ready. If your batter is not this thick enough/does not seem to be twice or triple in volume anymore, your castella will not rise, and you may have to start all over. Step 4: Put the batter in a baking pan lined with aluminum foil. Tap the pan against a counter to get rid of any air bubbles. Step 5: Place the baking pan into the oven for 10 minutes (which you have already preheated at 355 F/180 C). Step 6: Reduce the temperature to 320 F/160 C and continue baking for about 35-40 minutes. Stick a toothpick into the castella; it should come out clean. Step 7: Take out the castella from the oven and immediately flip it onto a sheet of wax paper. Doing this will help improve the appearance of your castella. Be careful when peeling the castella off the wax paper, as the surface tears easily. *Note: This tastes better when it is fully cooled. My mother is from Nagasaki perfecture, and her sisters sometimes sent packages of kasutera. Mom missed it enough that she made it a few times - I thought it was just as delicious, but she always said it wasn't as good as her mother's, or as good as the store's. I've made it as well - I don't think the kind that is imported to US Japanese stores is as good as either mom's or the kind my aunts sent - and it's time consuming but not difficult. It's very much a taste of my childhood. Although delicious, this doesn't taste like store-bought castella. It is too sweet (probably warranting 2 oz less sugar and one tablespoon fewer honey), and too eggy. One way to get around this would be to use mostly (or all) egg whites however, that is much more difficult to beat warm to stiff peaks. I'll try it again with my adjustments, and give you an update. thanks so much for the recipe, this cake is awesome! Love the chewy yet fluffy texture and delicate honey flavor. One alteration: I whisked the egg white and sugar first and then added the yolks one by one. Hi Maki san, thanks so much for posting this recipe online, it's a treasure! So amazingly happy~ It's yummy and delicious! After eating this cake, my dad asked my mom where she bought it from. He thought she bought it from some bakery! Thank you so so so much for this recipe! It was worth the burning muscle pain :D The wait was torture though. I was so worried that something might have gone wrong but I had to wait several hours to actually cut it and see whether or not it was a success. Hello, Ive been meaning to try out this recipe for awhile....but I am wondering, is the measurement for the flour before or after you sift the flour? It will be exactly the same whether you measure before or after sifting, since you are weighing the flour rather that using cup measures. Hi, I've tried making the cake today. It taste really great. Thanks for sharing this wonderful recipe and detailed explanation. I have reduced the sugar by 60g as I don't like it too sweet. It turns out perfect except that the top shrink towards the centre and has creases instead of a smooth surface. Do u know what could be the possible reason? I made this cake this week, just the kind of cake I like, moist and sweet, and also I like honey flavor of it. But I had to do some adjustment, I was whisking the eggs and sugar for 45 minute the way you had explained, but I didn't get anywhere, so in the end I put my mixer on the fastest speed and got the soft peak, I follow the rest as it is. Thank you it is delicious and I'll make it again and again. I've always wanted to try making my own kasutera and finally got around to making the recipe you shared. It turned out beautifully and it tastes great! It took me about an hour of whisking, so this is definitely not a recipe I will be making for any ol' occasion. I've baked this cake yesterday (and the optical result was good) and we ate it today. But my family didn't like it that much. Sure the taste was good (but nothing extraordinary) but it really was like a sponge. I prefer softer cakes. hi, I loved the cake recipe and I am so interested in such a cakes, I have made the cake yesterday but it fill and it's texture wasn't like the picture it was also more yellow-ish. 8 whole eggs but did not turn to white only the top of the mixture that was bubbly was almost white. hmm it's doesn't has a baking powder? It sounds like you did not whip the eggs enough. Getting it to the right state when whipping by hand takes a rather long time. No, it does not have baking powder, the recipe is correct. As I stated, it's not an easy cake to make I'm afraid, so if it doesn't work for you may want to try one of the other cakes on this site, which are way more forgiving. Thank you so much for posting the recipe. Can you tell me where I can buy the wooden mold made in Japan for this cake? haha i didn't have an electric hand mixer (just stand mixer), so I did it by hand... took over an hour and my wrist is super sore now. But, my cake was PERFECT. It worked really well. I had planned on making it in this and a regular glass baking dish but only had enough batter for the newspaper box. No sinking,... it deflated a bit when I put on the honey glaze but after i turned it upside down in the fridge, it looked even and perfect after an hour of cooling. I couldn't help myself and needed to look/taste after an hour. It is better the next morning, but still pretty good just an hour later. Thank you for this amazing blog/recipe/instructions! Hi, I just tried this recipe yesterday and it almost worked...! The only problems I had were that the top got kind of wrinkly after I took it out of the oven (due to shrinking... maybe I didn't bake it for long enough? ), and that the texture is not as fine as I'd like it to be. I guess I should whip the eggs for a bit longer. It still tastes lovely though, and the people I've shared it with are impressed (or too polite). One other thing: I read on this site http://www.thefreshloaf.com/node/22860/kasutera-castella-cake-thinking-j... that the castella has to be cooled upside-down, to prevent a dense layer from forming at the bottom. Is this true? I cooled mine upside-down just in case, and had no issues with unevenness. Just wondering, as your tutorial doesn't mention anything about it. Great recipe, nonetheless! You mentioned on the ingredients that we could use either all purpose or bread flour. I believe that those would make different on the result. So is it going to be softer and smoother if I use all purpose flour? I am thinking to put SP or ovalette in my egg mixture. Do you think that might work? Is it going to make the pore of the cake even bigger? Thank you for this recipe - it worked perfectly. I made this for my family's recent Hanami picnic. They loved it. Thank you. This recipe worked SO WELL and tasted SO GOOD! I especially appreciated the weights of ingredients given in grams; it made it so much easier for me to know exactly how many eggs and how much flour, etc. to use. MANY THANKS! Hello! I was wondering if instead of a regular cake tin I could use a silicone mould with the same dimensions. A silicone mold should work fine! Well I'm fairly late to the game, but hopefully you're still monitoring this. 1) Can you accidentally "Overwhip" the batter? I did by 15 mins on electric whisk and then an extra 5 mins after that before adding in the honey milk mixture and flour. 2) Is it ok if I didn't add in sugar to the eggs until about 5 mins into whisking? 3) When removing cake from pan into plastic bag for refrigeration, do you leave the cake in the parchment paper or remove to refrigerate? 4) Do the cupcakes also need to go into a plastic bag to refrigerate? If I used silicone cupcake molds for the cupcakes, should I remove them before I refrigerate or refrigerate them WITH the molds? Worked again like a charm!